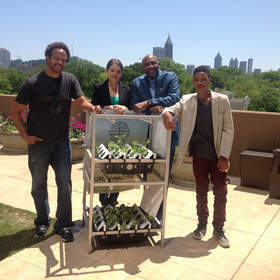 CENTRAL FALLS, RI and ATLANTA, GA--(Marketwired - Apr 21, 2015) - Irving A. Backman and Acopia Harvest's "Green Machine™" are featured at hands-on demonstrations of advanced sustainable hydroponics food production in celebration of Earth Day at a series of events hosted by Seeds Global, Atlanta Public Schools initiative, Wednesday, April 22, the 45th anniversary of the Earth Day movement. Supporting participants include Maynard Jackson High School Garden Club of Atlanta, GA; DeKalb County Government Environmental Sustainability Department; Birmingham Public School System, Birmingham, AL; and Elwood Academy, Selma, Alabama. Amy Chauvin, Acopia Harvest Research Director, will present the Acopia Harvest "Project Sprout Program," and the donation of a Green Machine™ Hydroponic Educational Indoor Growing System at each event. According to Acopia principal, Irving A. Backman, a seasoned developer of new technologies for over 35 years, "We are thrilled to celebrate Earth Day 2015 to help mobilize billions around the world to halt and possibly reverse Global Warming (climate change), one of the greatest threats facing our planet. Earth Day participants, and partners around the globe, focus on climate and water pollution education, innovation and sustainability." Mr. Backman added, "Our mission via "Project Sprout" has taken root in Rhode Island, Massachusetts, and New York focusing on implementing affordable, manageable, sustainable hydroponics systems in schools, homes and businesses around the world to reduce Global Warming and eliminate polluted water from traditional water systems." Earth Day events are opportunities for teachers, employees and students to learn about "Project Sprout" and the state-of-the-art Green Machine™ hydroponic system; healthy lifestyles, and how to grow nutritious, leafy vegetables indoors, year round in the office, at school and at home. These events present new career opportunities for graduate students and returning Veterans or those disabled. Before the year 2025, this generation -- all races, creeds and beliefs -- must accept the challenge to attack and revise the standards of health, environment, education and economic independence. All together, we must raise America's honor and leadership -- nationally and internationally --to new levels so that future generations obtain the benefits of one world, with similar goals of morality, sustainability and achievement. Everyone in my organization has made a commitment to help significantly reduce Global Warming by 2025, utilizing innovative and often disruptive technologies. Positive performance will make the critical difference!